The provision of PE and school sport is underpinned by the aims of our school. 1. A high quality provision of PE within school, staff with secure subject knowledge and very confident in delivering P.E. lessons. 2. Increased participation rates within school sporting activities. 3. An increase in competitive sports and greater success in competitions. 4. A physical education programme that is fully inclusive and in line with our Equal Opportunities Policy. 5. A range of alternative sporting activities. 6. Partnership work with local providers and other schools to get the best practice. 7. Pupils obtain greater awareness of a healthy lifestyle including learning the dangers of obesity and smoking and how they can affect their physical well-being. Develop cross curricular links to encourage children to share healthy living and safety message. 8. Develop and secure staff knowledge and skill in providing sporting/PE activity both in the curriculum and outside of school hours. The Sports Premium Grant is provided jointly by the Department for Education and Sport in Primary Schools. Schools receive a lump sum of money, plus an amount based on the number of pupils in the school. For the period September 2017 to August 2018, the school was allocated £17,680. This includes the additional money allocated to schools in the past 12 months to improve further the provision for sports and PE for primary aged pupils. The funding is based on 168 eligible pupils from 5 years to 11 years but is spent to benefit all children as part of our inclusive ethos. The school achieved the Silver Sainsbury School Games Award in 2017-18. We are currently collecting evidence for our application for the Gold Award this year, which we are hopeful of securing. · All children have been involved in competitive sporting activities, including some sports which are less common. · Pupils in Year 4 to 6 have opportunities to participate in outdoor learning opportunities through residential visits. · All pupils in school have had the opportunity to work on sporting activities with pupils from other schools including Severndale Special School. · The general level of fitness of most pupils is improving. · All pupils have experienced working as a team. · Targeted children are supported through invitation only groups to increase physical activity and fitness. · All year 2 children are given the opportunity to learn to swim prior to key stage 2 statutory swimming sessions begin. · Sport is being celebrated through newsletter, twitter account and website – children have wider range of opportunities to compete at their own level. · To strengthen cross curricular links to reinforce healthy living messages in a wider range of subject areas: Animation-groups to work on video clips for external screens; ‘Ready, steady, cook’ theme in Spring 2017; designing exercise videos for use at playtimes. · Work with new catering provider through the school council to ensure menu in school is reflecting healthy lifestyle choice. In addition to this, over the course of 2018 we have developed links with ‘Shrewsbury Town in the Community’ and are part of the ‘Premier Stars’ provision they are offering. Staff are benefiting from team teaching and sharing planning with trained coaches. This has had an impact on the confidence of staff to deliver high quality lessons which meet the needs of all children and has improved outcomes. 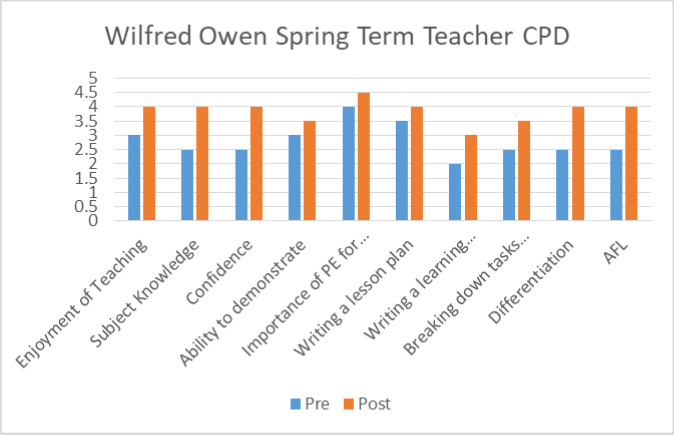 The graph shows the impact of this support over the Spring term 2018 from the start of the programme to the end of the term. Competitive School Sports Children have had a wide range of sports to take part in competitively, both in school (intra) and between schools (inter). Staff are competent in delivering a range of physical activity but continue to require additional support and training to differentiate teaching to target specific groups of children, to challenge more able children and to include reluctant children. To invest in additional CPD and coaching support for staff to improve quality of provision and planning to meet the needs of all children within the class. To develop a coaching scheme with Shrewsbury Town Football Club which will support staff in developing their own coaching ability and the opportunity to consider differentiation to meet the needs of the class. Introduced in KS2 to begin with and rolled out across whole school as systems become embedded. Children compete in tournaments across the year which they have not necessarily had the coaching and teaching prior to competing with other schools. This can have an impact on their ability to compete and the opportunities for them to succeed in these fixtures, which can have an impact on their confidence. Develop the long term plan to enable children to have had suitable experience and teaching of key skills and rules for sports which they will compete with other schools. Target additional coaching, after school activities and teaching to further develop the abilities of children who show particular skill or aptitude in a specific area of sport. Children who want to compete in teams are not always able to do so due to the entrance of A teams only at many events or the ability to get together a full B team due to the confidence of children. Establish across local schools a B team tournament which allows greater numbers of pupils to compete in tournaments. Teachers and coaching staff to identify any child showing potential to compete and give them opportunities to take part in B teams to build their own self-confidence and ability. Up to £500 for hosting tournament termly including trophy, certificates, staffing, refreshments. This will impact on children across a number of schools. Children are sometimes reluctant to take part in sports clubs if they do not feel that they are talented enough. Teachers and coaching staff to identify children who have talents and skills who may not attend clubs currently so the learning mentor can target them specifically for a place at a club. Invitation only sports clubs to be run termly so that reluctant children can develop basic skills which can be applied in PE sessions across the term. The school achieved the Silver award for the Sainsbury School Games award. To target the parts of the gold award action plan which may not be sufficiently well established and ensure that the gold award is achieved in the coming academic year. Engaging children at break times in purposeful activity which will improve their fitness and reduce levels of inactivity. Anomoly screen to be set to run exercise videos at break and lunch times daily so children can join in where possible. Lunch time sports clubs to be offered to increase participation of all children in exercise.